GRACO Finex Gravity Feed Mini / Spot Repair HVLP Spraygun. Please Specify set-up when ordering, i. Fluid Tip: 0.6, 0.8, 1.0, 1.2, 1.4mm. 0.6 - suits small model makers / artists. A set up that is midway between an airbrush and most spot repair guns. Suits detail smart work / small area. Suits water based basecoat / solvent basecoat / lacquer. Suits above for fuller panel work. Well balanced and lightweight, the Finex gun design offers a more affordable way to spray without sacrificing performance. Air Caps optimized for high quality spray performance. Integrated air inlet adjustment (cheater) valve. 3M PPS and aluminum cups available. Suitable for water or solvent. Maximum air inlet pressure: 7 bar (0.7 MPa, 100 psi). Maximum fluid working pressure: 7 bar (0.7 MPa, 100 psi). Maximum HVLP inbound air pressure: 2 bar (0.2 MPa, 29 psi). Air consumption: 7 cfm / 198 lpm at 2.0 bar (0.2 MPa, 29 psi). Fluid and air operating temperature range: 0-43° C (32-109°F). 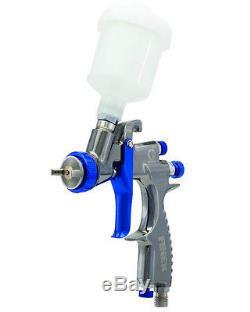 Spray Gun: Mini HVLP Gravity weight with cup - 0.4 kg (0.9 lb). Wetted parts: Aluminum, stainless steel, engineered plastic. Some feedback for this item. You can also find more product details and spares on the Sprayguns Direct website. All our items now come with. The service included in this offer varies depending on the item however you do have the option to upgrade to a faster service if required. Your item leaves us immediately. UK and surrounding British Isles (not Eire/Irish Republic) for (maybe longer for remote islands). UK and surrounding British Isles not Eire/Irish Republic. May be longer for remote islands. (average figure provided by postal service). We also often use UPS for EU locations where we state post, this is because it is a better service but cannot be offered to all areas due to UPS imposing "remote area surcharges" on some locations. The further from the UK you are, the longer the wait. Sprayguns Direct was first conceived in 2002 as we recognised the advantage of specialising in this complicated area of the market. The emphasis on online sales, backed up with specialist staff, helps us provide you with all the information you need to find exactly what you are looking for. We have since expanded in to all supplies for the bodyshop or paint shop and are authorised UK distributors for DeVilbiss, Sata, Iwata, Graco, 3M, Sealey, Standox, Dupont and more. Is a division of Morleys of Derby Ltd. A family business, established in 1966 and is run by the founder; David Clarke with the assistance of his three sons. The company also has a large support of specialist staff including ex sprayers who have been trained by DeVilbiss and Sata. You will be supplied with a V.
As products are sourced direct from the manufacturers, then you also have access to their technical services. The item "Graco Mini/Midi Finex Gravity Feed HVLP Spraygun" is in sale since Tuesday, September 26, 2017. This item is in the category "Vehicle Parts & Accessories\Garage Equipment & Tools\Air Tools\Spray Guns". The seller is "spraygunsdirect" and is located in Derby. This item can be shipped worldwide.